You do not have to be able to sew to join the Uniforms 4 Kids volunteer sewers. Ironing, unpicking shirts, removing buttons, all hands welcome in this program producing clothing for children in need from donated uniforms. At the Cooroy Shed Uniforms 4 Kids centre founder Yvonne Pattinson and her team meet every Friday morning at 9am. Warana sewers meet at Kimz Sewing & Patchwork Centre every Thursday at 1pm, where former professional designer Joy Enever is there to assist. 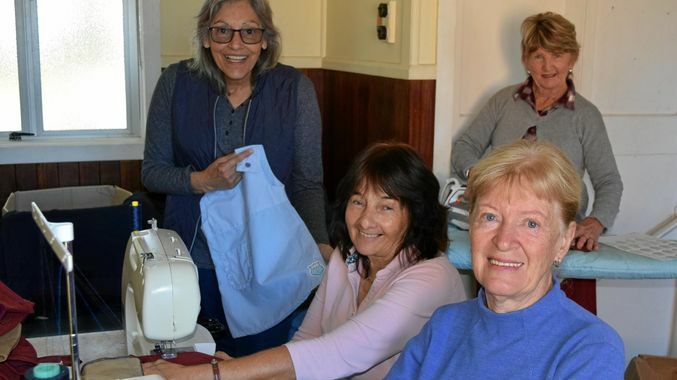 There are sewing machines at both centres, but volunteers do not have to sew there, just meet, gain ideas, collect stock to take home to work on at leisure. As Kimz is open all week, material can be collected, and any completed items delivered there for Joy to pick up on the Thursday. We will be opening sewing centres in all parts of Queensland as more volunteers come on board. In the mean time we can deliver uniforms to you and collect your finished articles of clothing. Contact Anne through the contact page. At present we have two permanent sewing centres – one in Cooroy and Warana. This is where our volunteers meet to exchange ideas, collect more uniforms and deliver work created. The Shed, rear of lot 2, 11 Emerald Street Cooroy. Kimz Sewing & Patchwork Centre.